Grilled chicken & steak are both some of my absolute favorite foods. I could seriously eat it every day. I am ALWAYS on the lookout for new marinades to try! 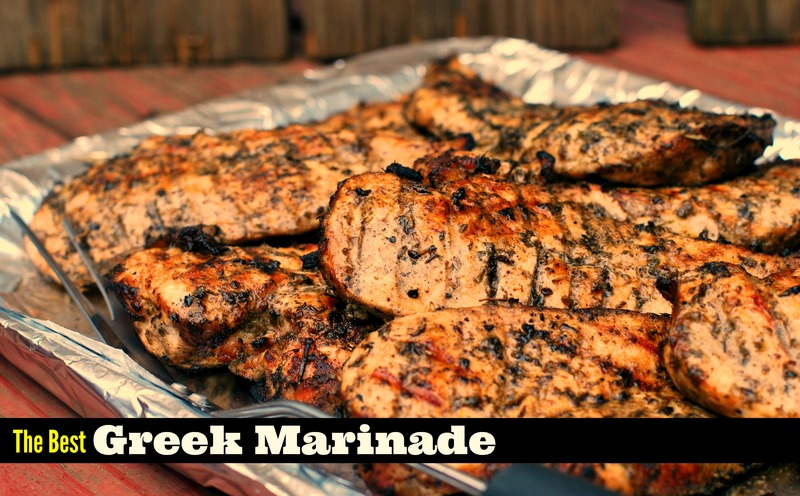 This Greek Marinade we tried last week is now at the top of my list of FAVORITE marinades! Oh my goodness! I have FINALLY figured out the secret to why it was SO moist, tender, and juicy: There is no salt in the marinade. That’s right. NONE! We like to marinade our chicken for 24 hours and the salt in a marinade can draw out the juices. NOT GOOD! So with this marinade, you grill the chicken then add salt to taste after it is done. Trust me! You won’t even go back to salting your marinades again! Hungry for more? Check out this VIRAL marinade that is BLOWING up on pinterest! Combine ingredients in a large ziplock freezer bag. Add chicken, pork or steak to bag and place bag in a large bowl in the fridge. Allow chicken or pork to marinade overnight. Steak only needs to marinade for a couple of hours. Grill and season with salt to taste & enjoy! This marinade could just be my next “go to” for the whole summer! I can see it flavoring up all kinds of meat/poultry. When I print your recipes the photo never prints. Do you have any idea why not? The photos are kind of a memory jogger for me. Thanks! Oh no! I will have to get Uncle Bee to check into that for me! Thanks for letting me know! Will report back!